The presentation will provide Council Members an opportunity to learn more about the Plan, ask questions, receive public input, and take action. In addition, an ordinance to create a Wichita Bicycle and Pedestrian Advisory Board is also scheduled for consideration by the City Council. 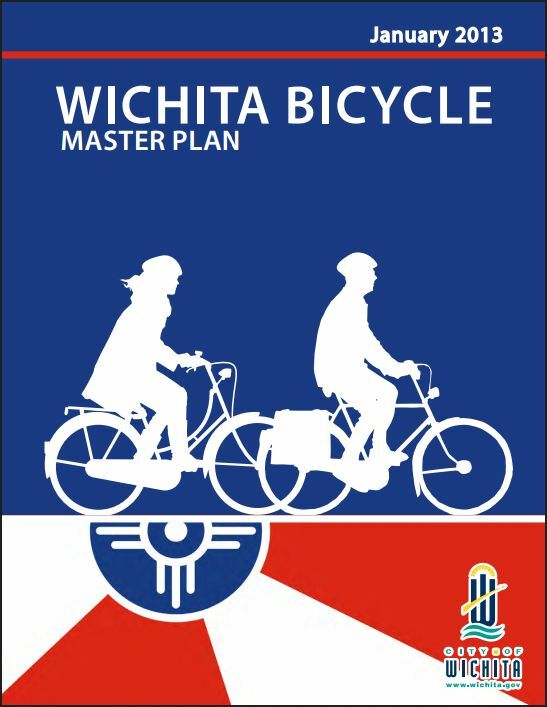 The Wichita Bicycle Master Plan recommends the creation of the Board in order to accomplish many things, including: creating on-going accountability; and identifying opportunities to improve conditions for bicycling and walking in Wichita. Individuals who wish to provide public comments are encouraged to do so either in person at the meeting or in writing. If you would like to provide input but are unable to attend, then you can submit written comments to the City Council Members. An interconnected network of on-and off-street bicycle facilities that accommodates bicycle riders of all skill levels; and links all areas of the City of Wichita — including employment centers, schools, parks, and other activity centers. Increase the amount of bicycling in Wichita. Benchmark: Triple the amount of bicycling in Wichita over the next ten years. Improve the safety of bicyclists in Wichita. Benchmark: Reduce the rate of bicycle crashes by one third over the next ten years. Foster and promote a culture where bicycling is a viable and acceptable form of transportation. Benchmark: Increase by 50 percent the percent of survey respondents rating ease of bicycle travel in Wichita as “excellent” or “good”. In the 1980s through the present, the City of Wichita focused on securing rights-of-way and constructing paths. They have become extremely popular among residents and visitors to the City. New paths offered opportunities for people to become more comfortable riding a bicycle for utilitarian and recreation trips. However, it soon became clear that improvements would also be needed in order to link paths and connect bicyclists directly to their destinations. The level of investment that will be required in order to implement this Plan is modest in comparison to other transportation facilities. The planning level cost estimate to implement the on-street elements and side paths of the 149 mile Priority Bicycle Network is $12.7 million. The Priority Bicycle Network includes approximately 32 miles of bicycle lanes, 38.7 miles of shared lane markings, 57.2 miles of bicycle boulevards and 12.1 miles of side path facilities. The estimated cost to implement the off-street facilities is $2.25 million, and would develop 4.5 miles of shared use paths. By comparison, the cost to develop one mile of a five lane arterial street is approximately $4 million. There’s lots more great, detailed information! But you’ll need to browse the Plan yourself to learn more. The results Passed 7-0 … plan, advisory committe & TE Projects!